Annual baby’s breath is a short lived annual native to the Caucasus where it grows in disturbed sites such as roadsides, meadows, and fields. It is a member of the carnation family, Caryophyllaceae, that also includes pinks, Lychnis, and soapwort. The erect plants tend to branch in the upper parts only and carry dark blue-green lanceolate leaves up to three inches long. The single flowers are about ½ inch across and produced in loose panicles on long slender stems during the summer. Each flowers has five notched petals that are usually white with faint pink or purple veins but cultivars with rose, pale pink, and carmine flowers are available. Flowering is profuse as long as temperatures remain below 85 F but plants tend to melt out in heat and humidity. 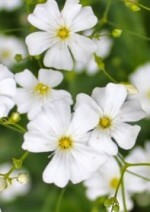 Annual baby’s breath is attractive in the garden and is an excellent cut flower with a vase life of five to seven days. It is useful in the rock garden and does well in raised beds. The generic name Gysophila comes from the Greek words gypsos meaning gypsum and philos meaning love and refers to the fact that some members of the gunus need alkaline soil. The specific epithet elegans is the Latin word meaning elegant.